With a ground source heat pump system (as with anything else), the designer must strike the right balance between installation and operating costs. This is true of all aspects of design, but is especially true of the interior piping design as well as the pump layout and selection. Even with the best design, the efficiency gains from a GSHP system can be completely erased by poor piping and pumping design (due to excessive head loss, oversized pumps, improper control, etc.). While there are many options with respect to pumping system layout and design, they generally fall into one of two categories: centralized or distributed. While there are merits to both approaches, the process of finding the best choice for your application starts with an evaluation of the the project. 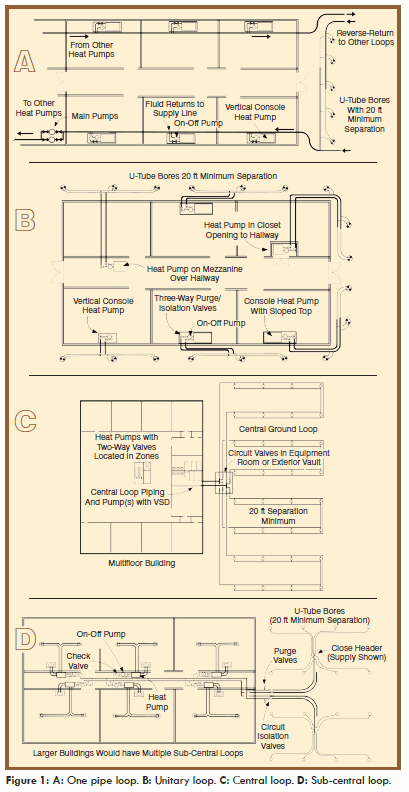 A centralized system will use one or more pumps at a central location to induce flow through the loopfield and then distribute it to the units scattered throughout the building, as shown in the illustration. For large systems that fall in this category, variable speed control is common (and may even be required)1. In general terms, the use of a centralized pump will be well-suited for a building with a small footprint where the interior piping can easily be connected to the GSHP units that are scattered throughout2. Centralized pumping may also be ideal for applications with significant load diversity where ‘load sharing’ principles can be used to reduce overall loopfield requirements3. Large pumps generally have better overall efficiency values than the smaller pumps used in distributed arrangements. When required, maintenance is performed at the central pumping station (located in the mechanical room or dedicated pump house) which provides adequate access and minimal disturbance to the rest of the building. Maintenance costs and personnel requirements are generally the lowest with this approach. A large interior piping loop must be used to connect all of the GSHP units to the central circulating pump, which requires proper design, increases complexity, requires the use of larger pipe sizes and drives up installation cost. VFD flow control can be complicated and central systems must be balanced for proper operation4. Failure or shutdown of the pumping system will cause the entire system to be down. Buildings with small footprints and/or significant load diversity2. To avoid system shutdown due to failure or routine maintenance, redundancy with a standby pump (in parallel with the main pump) is recommended. With redundant pumps, duty cycling is important to help with pump longevity and to even out service life expectancy. When variable speed control is required, flow control measures (such as zone valves and pressure sensors) are necessary. With variable speed control, the pressure drop in the distribution piping should be kept low. Additionally, the system should be balanced during startup to ensure proper control can be achieved. 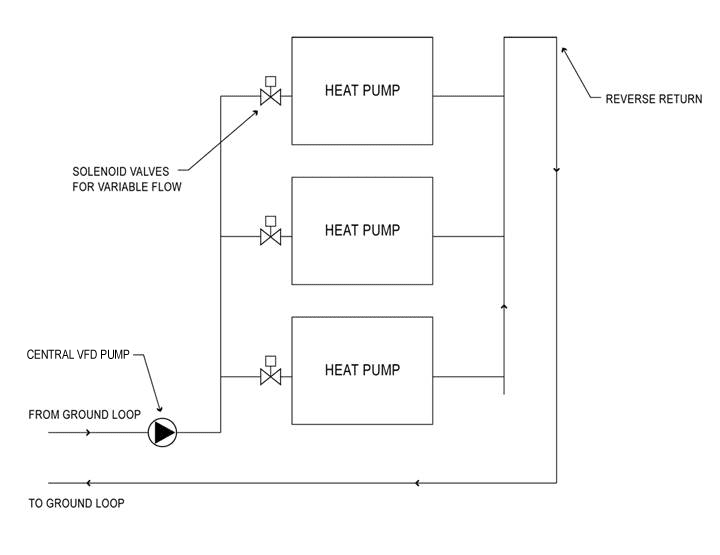 Variable speed pumps should be designed to never operate below 25% of design flowrate to ensure that the motor and VFD efficiencies remain relatively high. For most GSHP systems, a large percentage of operating hours for the year will be at the lower end of the flowrate (idle or with 20% to 40% of GSHP units operating). In a large GSHP system, a centralized pumping solution may be beneficial because of the low number of pumps required along with their central placement (which comes in handy when maintenance is required). 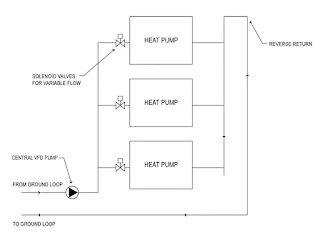 But the system designer must select a pump that meets pressure and flow requirements while also providing economical operation, which can be tricky at part load conditions. Because of the increased complexity of system design and control, as well as the lower limit on flow with variable speed equipment, it may be worth looking at the Pros and Cons of Distributed Pumping to see if it is a better fit for your application and more importantly, a better fit for your customer. Refer to Chapter 6 in Geothermal Heating and Cooling: Design of Ground-Source Heat Pump Systems (Kavanaugh and Rafferty, 2014). LoopLink PRO can be used determine how much ground loop reduction is possible with load sharing principles for a given system. A recent GSHP field study indicated that less than 10% of the ground-loop variable speed pumps with differential pressure transducer control were operating as intended due to faulty controls or had pumps large enough to provide near full-load flow rate at minimum motor speed (Kavanaugh 2012).